This National Water Week, October 18 to 24, South Gippsland Water staff are Choosing Tap and challenging themselves to drink more water with the VicHealth H30 Challenge. South Gippsland is blessed to have tap water sourced from the rolling green hills and picturesque rivers and creeks throughout our region. Its then clarified and treated to ensure it meets Australia’s national drinking water standards. So customers can be assured that drinking tap water is a healthy choice to make for themselves and their families. South Gippsland Water are not the only ones who think drinking tap water is a great idea. VicHealth has the H30 Challenge where people are encouraged to switch sugary drinks for tap water for 30 days. So this National Water Week, Be Smart Choose Tap! 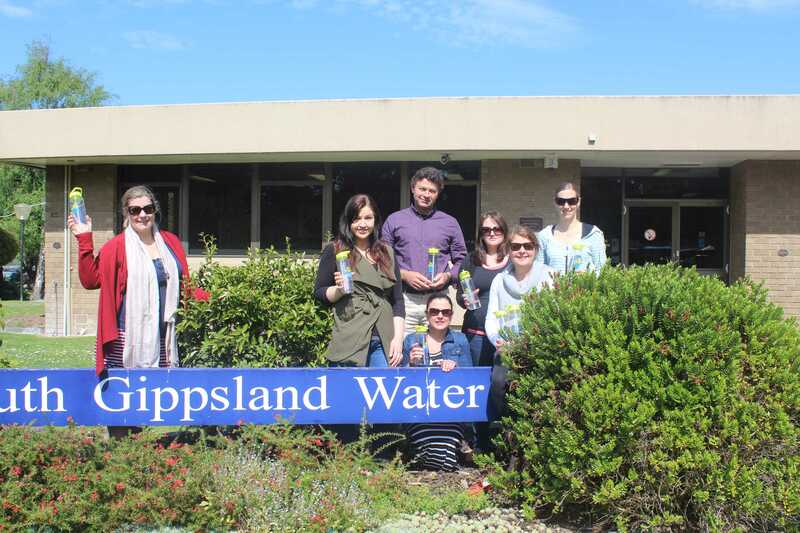 Photo: L:R: South Gippsland Water staff with their Choose Tap drink bottles: Amy Van Kuyk, Brea Robb, Rob McKaige, Antionette Moar, Paula Smith, Ros Griggs and Bree Wiggins.